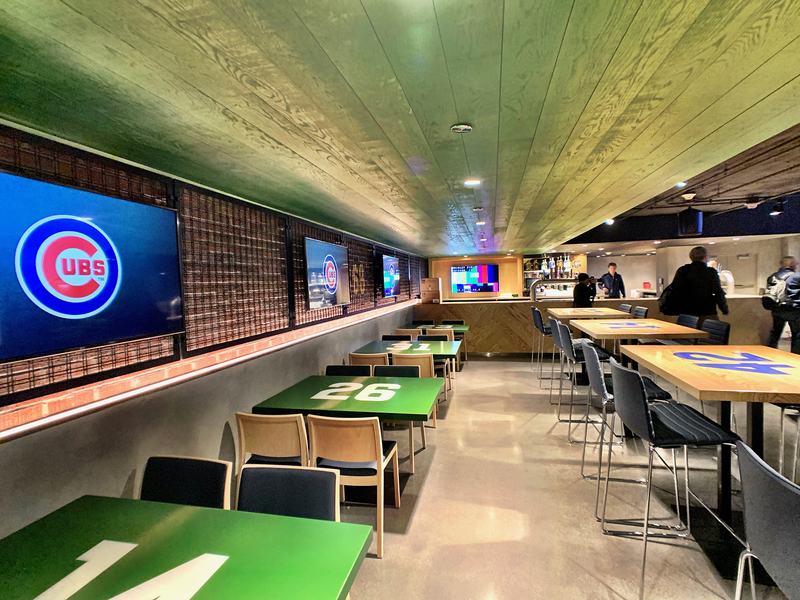 With the dawn of the 2019 home season today, the Chicago Cubs are unveiling several upgrades to Wrigley Field and other new fan areas as the 1060 Project wraps up, including three new clubs and a host of new social spaces. This year’s upgrades come at the tail end of a multi-year, $550-million 1060 Project renovation that began in 2015, with the Friendly Confines overhauled from top to bottom, from inside to outside. The renovations began with structural repairs to the Wrigley Field steel and concrete infrastructure—repairs that allow for much of what is being unveiled today. With the 2019 work, there’s very little of the old ballpark that was not touched in some way, whether it was the addition of new high-end seating behind home plate—requiring a move of the dugouts—or the new club sections under the grandstand or new social spaces in the bleachers. There are more upgrades to be unveiled this year and next (the Audi Club will remain closed, with a 2020 reopening expected), but for now, the 2019 changes, as directed by the team and implemented by Populous, mark the end of large-scale renovations to MLB’s second-oldest ballpark, opening in 1914. And while change has been a constant at Wrigley Field over the years—heck, at one point the grandstand was split and moved, and there have been multiple iterations of the outfield bleachers—it’s safe to say the 1060 Project renovations were the most extensive upgrades to Wrigley Field in its long and storied history. So it’s not a surprise that two of the three new club spaces have direct links to Chicago Cubs history, while another club echoes the old Chicago speakeasy era. The Cubs unveiled the American Airlines 1914 Club last year, and this season the 700-capacity club is now flanked by two smaller, 250-capacity clubs: the W Club and the Maker’s Mark Barrel Room. All three are tucked under the grandstand some 11 feet below grade, and all three open out to specific seating areas in behind home plate. The W Club is on the third-base side and abuts the home batting cages. With the renovations, both clubhouses were expanded: the new home clubhouse is below an adjacent plaza, while the existing visitors clubhouse was expanded. (More on that in a bit.) How close is the W Club to the new batting cages? Windows give fans a peek to players warming up before or during a game. And while the batting tunnels can be screened off, the Cubs are hoping players will give fans a show. “There are a lot of things in here tied to the baseball product or the ballpark itself,” said Cubs Vice President of Wrigley Field Restoration and Expansion Carl Rice, differentiating the space between it and the other new spaces. “Whether it’s the brick on the back wall here, a seeming extension of the brick wall above, the field wall is approximately in that same spot. Extending that history theme: Two display cases displaying World Series WS memorabilia. During the season it may be changed out with balls or bats used in a recent big win. The point is to change things up to bring folks back regularly. Of course, there’s a full-service bar and baseball food, as well as plenty of high-def displays for following the action on the field. For those in a hurry, there’s a grab and go section at the top of the stairs leading to the seating bowl. This is open to season-ticket holders for the W Club section. Though there are some historical photos of Cubs greats, the new Maker’s Mark Barrel Room—on the first-base side of the 1914 Club—is more a throwback to the speakeasy era of Chicago drinking. The original concept had more of a speakeasy feel, but the design changed when Maker’s Mark came on board. Added was a barrel room at the end of the club (complete with a bourbon barrel signed by Tom Ricketts), as well as a chandelier sporting plenty of Maker’s Mark bottles. Located adjacent to the visitors batting tunnels, there are some hidden windows opening to the space, located behind some of the historic photos. (How can you tell? The wood used on the frames is slightly different in color.) Another tie to Maker’s Mark: the bar trim is made of staves from Maker’s Mark barrels. While the seats for the W Club are located next to the home dugout, the seats for the Maker’s Mark Barrel Room are next to the visiting dugout. Access is limited to members. As noted, new clubhouses for both the home and visitors were part of the 1060 Project. This year saw an expansion of the visitors clubhouse, adding a kitchen, support spaces and more locker spaces to the mix. The space now accommodates 40 players, with a separate new space for coaches. It’s still not a huge space, by any stretch, but the old configuration was very small by MLB standards. Does this mean the new Wrigley Field has a shot at landing an All-Star Game? There has been no discussion of how this upgrade would affect a bid, according to Rice, but he did note the clubhouse meets the facilities rules for new ballparks set forth by MLB—even though old ballparks do not need to meet them. The final new club space for 2019 may be the nicest of all: the Catalina Club, located in the upper sections of the ballpark. It’s named for California’s Catalina Island, where former Cubs owner William Wrigley Jr. held a controlling interest in the Santa Catalina Island Company and sent his beloved Cubs to train there each spring. The 400-capacity space even sports the logo used by the team when training there, along with tile accents featuring historic team logos.The only new club with a view of the action, the climate-controlled space is in demand—sold out for the season. “This experience is prime in the Wrigley experience,” Rice said. “In fact, it’s the only one that you can actually see the ballpark besides being on the suite level.” A full-service bar and grill are part of the space, which opens to sections with padded seats. It also includes access to a patio facing Clark, with its own bar and grill outside. The effort to repair and strengthen Wrigley Field’s steel infrastructure, as well as the removal of walls and roofs to open new spaces, is a prime reason why the Catalina Club and a right-field extension of the suite level could be added. It’s also enabled new upper-level group spaces outside the seating bowl, facing Clark Street. Three new upper-level patios follow the curve of the grandstand. These large spaces mirror each other in right and left field, with a recessed section in the middle. They offer all the amenities of the grandstand: concession stands, portables on two ends, larger bathrooms and separate cocktail/beer bars. “The idea is really to provide to our upper-deck patrons the same service found [elsewhere in the ballpark],” Rice said. Besides giving upper-deck patrons a space to congregate in the course of a game, the new space is also designed as an additional path from one side of the ballpark to the other. Yes, there are televisions for keeping track of the action on the field. Two other new group spaces are on tap for 2019. The Cubs aren’t billing these spots as social spaces—one of the big current trends in venue design—but that’s basically what they are. We visited a new deck in the left field corner, an extension of the bleacher deck. The raised area provides a great view of the action (as shown above); with its own point of sale, we predict it will be a hot spot, with fans flocking to claim a spot at the drink rail. The Cubs are not committing to keeping this as an open space and may end up converting it to a group space during the course of the season. It holds 75 people. Another similar space will open in the right-field corner, while the team also works on a replacement for the Captain Morgan Club. That’s probably a wise move. With so many new spaces, it’s not possible to totally predict traffic flows: fans have a funny way to choosing their own routes to their seats, even when you try to sweeten certain areas with expanded restrooms and additional points of sale. The first few weeks of play should give the Cubs and the fans time to get a feel for the addition. The Cubs also renumbered seating in the ballpark, changing from aisles to sections, and although the new signage looks to be crystal clear, there will undoubtedly be confusion as both patron and staff adjust to the changes. But these are short-term concerns. In the long run, the 1060 Project was a needed renovation of a ballpark needing some TLC, keeping what makes Wrigley Field so loved. We still have the statues of Ron Santo, Billy Williams and Ernie Banks, while Harry Caray still greets fans arriving from Murphy’s Bleachers. The 2019 changes combine key elements of what fans expect in the modern ballpark experience along with recognition of the team’s storied past and the unique place Wrigley Field occupies in both Chicago and MLB history. It looks like we’re all good for another 100 years.